I cannot believe a quarter of the year is nearly already over, but you know that means it is time to check into my yearly goals to see my progress and see if I need to adjust myself to reach my goals. 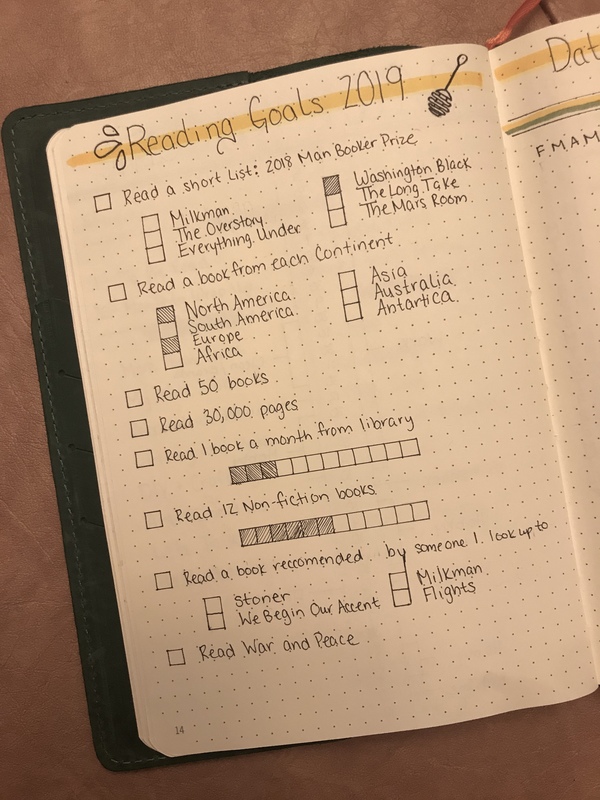 If you want to see the entire post explaining my 2019 goals, you can read that post here: Reading Goals | 2019 Edition. Anyway, I thought I would do a brief list of the goals and then I would do a but of commenting on them. I also want to share my updated yearly goals spread in my bullet journal. I am a very visual person so having that in my bullet journal really helps. 1. At this time I have only read 1 of the 6 books from this shortlist. This book is such an adventure, it starts with a young boy, age 11. Sadly, he is a slave on a sugar plantation in Barbados run by two brothers. The author wrote a beautiful book that shows the ugly that is slavery. It talks about awful psychological games played by owners and the bad treatment many had to endure unfairly. I also like how the author showed abolitionists and aspects of the underground railroad. The dangers of faced by those who escaped and freed those who did not belong to them. I also really enjoyed the science, art, and almost steampunk elements. I am honestly not doing this book justice, but I will say it was shortlisted for the Man Booker Prize in 2018 and it is well deserved. I also have to agree with the quote on the front of my book calling it a masterpiece. 2. At this time I have read 2 books for this goal. I have read for North America and Europe. I have picked up three more books for this challenge. Those being Africa, Antartica, and Asia. If you have any recommendations for South America, please share! 3. At this time I have read 19 books, I am 9 books ahead of schedule! 4. At this point in time I have read 9498 pages, so I am nearly a third of the way to my goal. So theory I should be finishing this before the year is out and I am on track. 5. So far I gave stuck to that, at minimum I have read a book a month from the library. 6. Looking at the 19 books I have read this year, a total of 6 books have been non-fiction. So, I am already 50% done with this goal. 7. At this time I have read 0 books for this goal, I did buy Milkman by Anna Burns, but with recent reviews I am a little afraid to pick it up. I have very similar taste in books to one of my friends and she did not enjoy it, I think she told me she DNFed it or struggled to read it. 8. At this time I have read 2 sections of the 17 I set up for the year. I am a bit behind because I focused on reading Monte Cristo with Jenna and put War and Peace on the back burner. I plan on picking it back up in April. 9. As of writing this I am going very well with my backlist. I have 20 books on my backlist, which I am very ecstatic about! Overall, for only being a quarter into the year, I think I am doing very well for myself. I know with the OWLs Readathon coming up I will be getting though many more books as well. Plus, I do a lot of reading in the warmer months of the year and I have plenty of time. How are your goals progressing so far? What goals did you get for yourself in 2019? A big thank-you to Misty for tagging me, you should all check her out. Her blog is wonderful! I started my blog to have a place to talk books with others. While some of my friends read, they are not as into it as me and read different books than me. While I love hearing about books I never heard of and reading some of them sometimes I just want to fangirl about a book that my friends would have no interest in at all. I would say my all time favorite book is Little Women by Louisa May Alcott. When I was younger I fell in love with the March family and it really sparked my creativity. To this day I reread it often and I still enjoy it immensely. I dislike when people are not considerate or compassionate towards other people. I often find myself getting mad when people are nice enough when people hold the door open for someone and they ignore them. For me it is not difficult nor does it take a lot of energy to say, “Thank-you”. What Is Your Favorite Food A The Mall? When I am at the mall I always eat Taco Bell. Tacos have been my favorite food since I was a little girl and while I make them at home Taco Bell is my go to when I am out and about. In my free time I am usually reading, watching youtube, or crafting something. I Nominate: Anyone who would like to do this tag, I know it has been around longer than my blog so I am not sure who has or has not done it. If you haven’t and would like to please feel free to consider yourself tagged. I was tagged by the wonderful Misty over at mistysbookspace, you should really check her out! My plants. I love nature and love being surrounded by it. I currently have a moon cactus, an ivory tower, a sunset jade, and a Zebra plant indoors. If you follow me on Instagram and/or twitter you have seen them in my story or in a tweet. Here is a picture of some of my plants before I repotted them. Going on walks with my boyfriend. I love going on walks it is a time where I can unwind and it is just me and my boyfriend without distractions. Finding a new favorite book! Decorating. I enjoy interior decorating I am always changing my room as well as other rooms around the house. Good conversations, to me there is nothing better than having a good conversations with another person. My music tastes are all over the place and depend on my mood, but lately these are the top five songs that make me happy. Each is linked to a youtube video so you can listen if you would like. Plus anyone else who would like to do this tag. If you have done it please leave the link in the comments I would love to read them!